Today's dismal Nokia second-quarter earnings results offer little good news. Apple now leads Nokia in smartphone sales, 20.3 million units to 16.7 million. The sliver of good news: Nokia will ship a Windows Phone handset this year, which probably isn't soon enough. Nokia smartphone sales collapsed during second quarter, plummeting an awe-numbing 34 percent year over year. By comparison Apple smartphone sales soared by 142 percent. The percentages alone are sobering enough. Wireless analyst Tomi Ahonen offers the epitaph: "15 years after inventing the smartphone in 1996 with the iconoic but outrageously expensive Nokia 9000 Communicator, and selling more smartphones than any rival every single quarter since then, we have now seen a moment in history: The king has been toppled". Nokia's problems are bigger than the Windows Phone transition, but it's surely one of the biggest influencers on the quarter's dismal performance. In February, Nokia announced that it would make Windows Phone its primary operating system. The handset maker later outsourced then primary OS Symbian and sent 7,000 employees packing. I warned in February: "Nokia will lose customers and market share. It's the inevitable consequence of such a massive operating system switch. Timing is terrible. Android OS sales increased 888.8 percent year over year in 2010, according to Gartner, propelling the Symbian rival to second place in global smartphone operating system share. Meanwhile, Apple is building iOS into a formidable mobile platform across three devices, including hot-selling iPad. A mobile OS transition of this magnitude will take years. Nokia doesn't have the time". Google is activating 550,000 Androids a day now, and Apple sold 367,000 smartphones per day during calendar second quarter. Nokia would have been better off fixing problems internally instead of handing them off to Microsoft. It's one reason I asked in June: "Has Stephen Elop doomed Nokia?" CEO Elop ranted about Nokia's "burning platform" days before announcing the Microsoft deal. His statements since have created negative perceptions about the company's future and the Nokia brand. Nokia has one of the world's most recognizable brands (not that Americans would know this). "More people use a Nokia phone than drink a Coca Cola, than wear Levis's jeans, than tell time on a Timex watch, than wear Nike running shoes, than smoke Marlboro cigarettes, or write with a Bic pen", Ahonen writes. He and I share similar opinions about Elop's brand-crushing activities. "What was life like before Stephen Elop started to destroy the brand most widely spread on the planet?" Ahonen asks. Much better is answer. While Nokia was bleeding share before, the Windows Phone transition and Elop's performance leading it have opened an artery. Nokia is rapidly losing ground in developing markets, China and India most notably, where it has long dominated with overwhelming market share. Sales to China fell by more than half, for example. Meanwhile, Asia-Pacific is Apple's fastest growing region, with revenues up 247 percent year over year. During first quarter, when the Microsoft deal was announced, Nokia sold more than 24 million smartphones. Three months later: 16.7 million, a decline of nearly a third. That's the real impact of the Windows Phone transition. Over at GigaOM, Kevin Tofel offers a sadly astute analysis of Nokia's problems, which are likely to get worse before they get better (if ever). He rightly asks: "Nokia is surely in a transition, but a transition to what?" The answer isn't good. 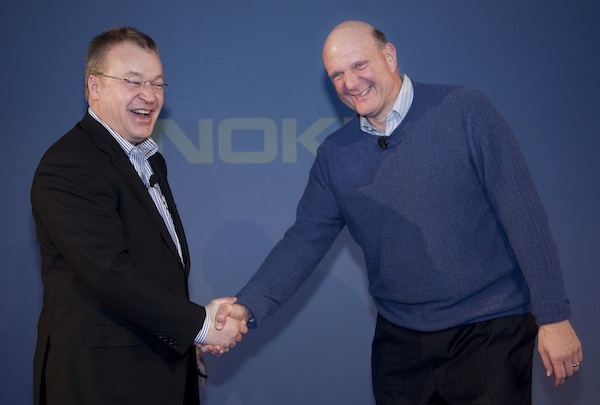 Nokia's smartphone division was profitable before Elop left Microsoft for the Finnish handset maker in September 2010. The division is now losing money. So is the entire company, which posted a $692 million loss today.